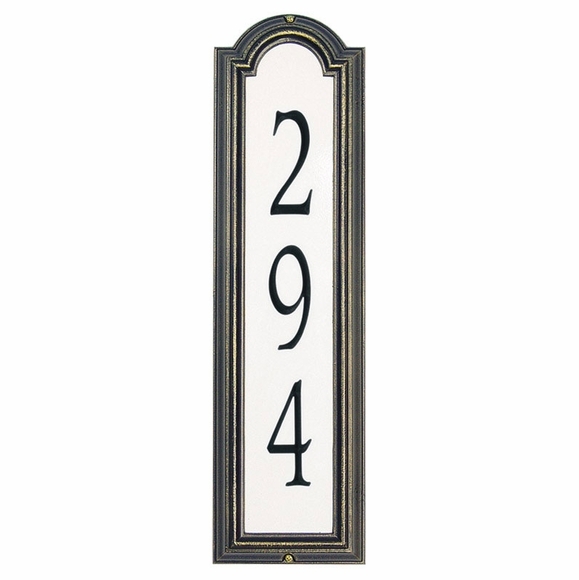 Personalized Vertical Reflective Address Sign -- Nite Bright™ reflective plaque holds four numbers. Made in USA. Fits in many tall, thin spaces that are too narrow for horizontal plaques. 21"H x 7.25"W x 1.25"D holds four 4" numbers. 26.5"H x 7.25"W x 1.25"D holds four 5" numbers. Frame colors: french bronze (shown above), pewter, black.